It was my final Falcon Cup as a father yesterday! Ocean is in grade 5 and she will be in middle school next year. 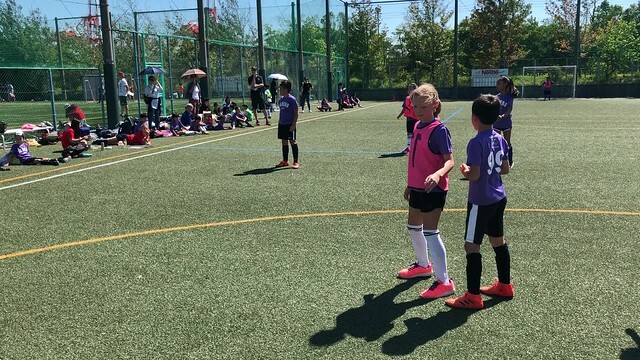 The Falcon Cup is the annual elementary soccer tournament held at Canadian Academy on Rokko Island. I love coaching young people and it was such a delightful day in the autumn sun. Coaching the elementary soccer teams also gives me an excuse to spend more time with Ocean. Her team lost a tough game, 0-1 but then came back to win 4-0 in the second game. In the elimination round, they lost 2-3 to the top OIS team. Ocean is ready for defense! Ocean is a pretty good athlete. She is tall, slender and coordinated with pretty good strength and speed. She does lack a bit of aggressiveness, I think because she has such an empathetic and level-headed nature to her. You can see from the video highlights that she is active and contributes to her team. Even though we did not win any trophies yesterday, all 5 of our teams won at least one game and most importantly, the kids enjoyed a day of exercise, teamwork and experiencing the ups and downs of winning and losing. I would like to thank CA athletic director Sim Cook for hosting the tournament and my coaching partner, Trevor Jones, for his work with the students and being such a good guy.